The conventional approach to river protection has focused on water quality and maintaining some ""minimum"" flow that was thought necessary to ensure the viability of a river. In recent years, however, scientific research has underscored the idea that the ecological health of a river system depends not on a minimum amount of water at any one time but on the naturally variable quantity and timing of flows throughout the year. Sandra Postel and Brian Richter offer case studies of river management from the United States (the San Pedro, Green, and Missouri), Australia (the Brisbane), and South Africa (the Sabie), along with numerous examples of new and innovative policy approaches that are being implemented in those and other countries. Rivers for Life presents a global perspective on the challenges of managing water for people and nature, with a concise yet comprehensive overview of the relevant science, policy, and management issues. It presents exciting and inspirational information for anyone concerned with water policy, planning and management, river conservation, freshwater biodiversity, or related topics. "...a clarion call to society for the need to balance human demands with the needs of our world's rivers, the arterial system of life on this planet. The authors describe the vanguard movement to restore rivers and to reconnect rivers with their flood plains, portraying the under-appreciated life support services our rivers perform, their ecological function, and the threats to riverine ecosystems." "Finally! 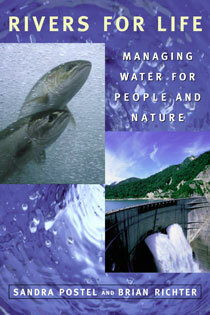 A book that pays attention to flow, not just pollutants, as central to river restoration. Blending science and readability, Rivers for Life offers refreshing insights into allocating limited water to meet the needs of humans and rivers." Chapter 1. Where Have All the Rivers Gone? Chapter 2. How Much Water Does a River Need? -South Africa Pioneers the Water "Reserve"
-Australia Overhauls Water Policy and Tries a "Cap"
-A Comeback Chance for the Missouri? -River Basin Commissions Work "Outside the Box"
Chapter 6. Epilogue: Can We Save Earth's Rivers?